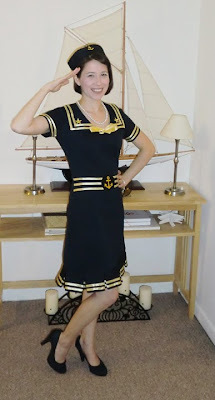 Nautical by Nature: Nautical Outfit of the Week: Halloween! Here is Michele, owner of the nautical Etsy store, Seachele Studios. Michele paired a store-bought Navy Girl Halloween costume with her own navy blue heels, a string of pearls and red lipstick for a little retro flair! Her grandfather was a Navy Submariner in World War II and so nautical runs in the family!